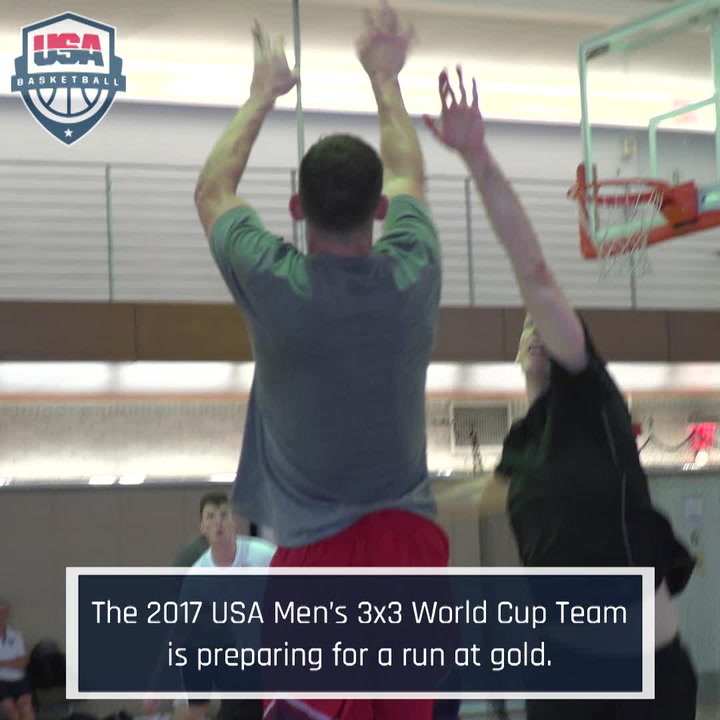 The 12 men’s and 12 women’s teams that will compete April 13-14 in the 2019 USA Basketball 3x3 U18 National Championships at the United States Olympic Training Center in Colorado Springs, Colorado, have been submitted to USA Basketball. The confirmed teams for the event, which is free and open to the public, feature 19 athletes who have played in past USA 3x3 U18 Nationals and 29 who have taken part in a prior USA Basketball five-on-five trials or training camp. Teams have until April 12 to submit changes to their rosters. The USA 3x3 U18 Nationals will tip-off the morning of Saturday, April 13, with preliminary round games held at the USOTC in Sports Center 2. After teams are seeded based on preliminary records, the knockout rounds will begin Sunday morning in Sports Center 1. Olympic fans will see the launch of a new basketball discipline with the inclusion of 3x3 in 2020. The exciting and fast-paced game officially was unveiled in international competition at the 2010 Youth Olympic Games and since has become a fan favorite at FIBA 3x3 World Cup events. Played on a half court with a 10-minute clock and a 12-second shot clock, the first team to 21 points, or the team in the lead at the end of regulation, is the winner. The non-stop action of 3x3 will ensure it is one of the hottest tickets in Tokyo, and fans will get an early taste of that excitement during the USA Basketball 3x3 U18 National Championships. 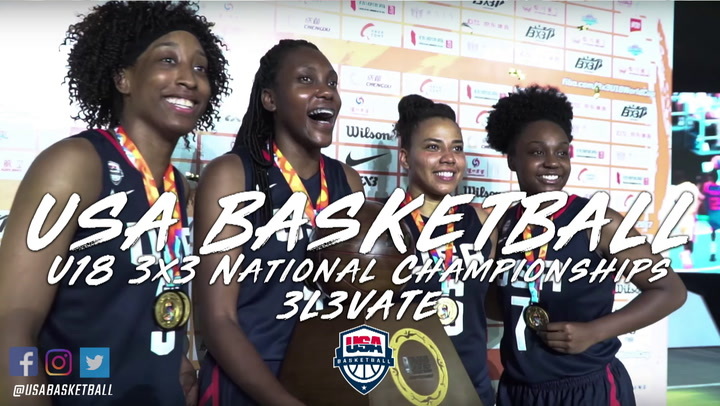 Participating teams earned their spots in the 2019 USA Basketball 3x3 U18 National Championships either through a 3x3 qualifying tournament or via an invitation from USA Basketball. The event has been annually in Colorado Springs, Colorado, since 2012 for men and 2013 for women. All 12 men’s teams are confirmed, and the athletes listed on the preliminary rosters represent 10 states. Pennsylvania will be represented by 11 athletes, Illinois lists nine and Colorado is represented by eight athletes. Also represented are Florida and Washington with four apiece; Oregon with three; Minnesota and Ohio have two each; and North Carolina and Virginia are each represented by one athlete. Playing for Attack are Dudley Blackwell (Huntington Prep/Miramar, Fla.); Kendall Brown (East Ridge H.S./Cottage Grove, Minn.); Nimari Burnett (Prolific Prep/Chicago, Ill.); and Henry Coleman III (Trinity Episcopal School/Richmond, Va.). Cubs Hoops features Luke Cochran (Highlands H.S./Natrona Heights, Pa.); Colin McQuiston (Shenango H.S./Wampum, Pa.); Michael Noonan (Greater Latrobe H.S./Greensburg, Pa.); and Patrick Shanahan (Pine-Richland H.S./Wexford, Pa.). H20 is comprised of Vuk Djuric (Lane Tech H.S./Chicago, Ill.); Michael Molloy (Lane Tech H.S./Chicago, Ill.); James Mulvaney (Lane Tech H.S./Chicago, Ill.); and Dominic Sucich (Lane Tech H.S./Chicago, Ill.). Hard 2 Guard’s roster includes Alejandro Garces (Dunedin H.S./Miami, Fla.); Richard Picot (Clearwater, Fla.); Alex Vitucci (Countryside H.S./Clearwater, Fla.); and one athlete to be determined. The Hoopla squad includes Andrew Classen (Wilsonville H.S./Wilsonville, Ore.); Cason Dougall (Wilsonville H.S./Wilsonville, Ore.); Hayden Nichols (Wilsonville H.S./Wilsonville, Ore.); and one athlete to be determined. Love Academy features Sebastian Cole (Cherry Creek H.S./Aurora, Colo.); Graham Ike (Overland H.S. /Aurora, Colo.); Dayne Prim (Grandview H.S./Aurora, Colo.); and Hezekiah Swanson (Overland H.S./Aurora, Colo.). Lane Tech’s team is comprised of Rashad Harries (Lane Tech H.S./Chicago, Ill.); Cleveland Jones (Lane Tech H/Chicago, Ill.); Eric Stemper (Lane Tech H.S./Chicago, Ill.); and Aaron Varilla (Lane Tech H.S./Chicago, Ill.). Legacy’s team is Jordan Gombs (New Foundations Charter H.S./Philadelphia, Pa.); Dylan McMaster (Swenson Arts & Technology/Philadelphia, Pa.); Nathan Rosario (Parkway Center City Middle College/Philadelphia, Pa.); and Jeron Simmons-Joyner (Parkway Center City Middle College/Philadelphia, Pa.). The Roots Academy team is Damon Gaither (Tumwater H.S./Olympia, Wash.); Alfredo Ramirez-Cortex (Olympia H.S./Olympia, Wash.); Dylan Sawyer (Olympia H.S./Olympia, Wash.); and Andrew Swanson (Olympia H.S./Olympia, Wash.). PLUTO is comprised of Noah Baca (Lewis-Palmer H.S./Monument, Colo.); Rhaven Brown (Falcon H.S./Falcon, Colo.); Zion Ruckard (Eaglecrest H.S./Aurora, Colo.); and Joel Scott (Lewis-Palmer H.S./Monument, Colo.). Pursuit is comprised of Dawson Garcia (Prior Lake H.S./Prior Lake, Minn.); Carson McCorkle (Greensboro Day School/Greensboro, N.C.); and Ethan Morton (Butler H.S./Butler, Pa.). Team Cure features Ethan Andersen (Boardman H.S./Youngstown, Ohio); Joey Petcash (Pine-Richland H.S./Pittsburgh, Pa.); Brayden Reynolds (Chartiers Valley H.S./Bridgeville, Pa.); and Todd Simons (Fitch H.S./Austintown, Ohio). The 12 women’s teams represent 22 states, with Colorado and Pennsylvania represented the most with eight athletes apiece, Texas has six athletes and New York is represented by four athletes. Also represented are Georgia, Tennessee, Michigan, North Carolina and Virginia with two each; and Arkansas, California, Illinois, Indiana, Kansas, Maryland, Massachusetts, Minnesota, New Jersey, Oklahoma, Oregon and Washington are each represented by one athlete. Competing for Blue Star 30 Stars are Sasha Goforth (Fayetteville H.S./Fayetteville, Ark. ); Greta Kampschroeder (Naperville North H.S./Naperville, Ill.); Ally Vantimmeren (Jenison H.S./Allendale, Mich.); and Payton Verhulst (Bishop Miege H.S./De Soto, Kan.). Cyfair includes Kyndall Hunter (Cypress Creek H.S./Houston, Texas); Jordyn Merritt (Plano Senior H.S./Plano, Texas); Aaliyah Moore (Moore H.S./Moore, Okla.); and Jewel Spear (The Colony H.S./The Colony, Texas). 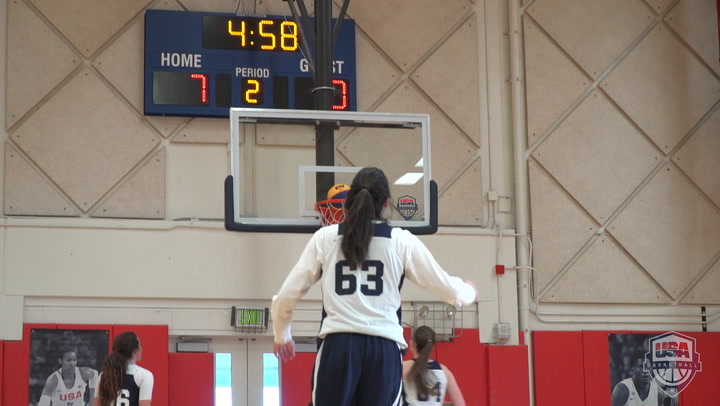 Hardwood Elite lists Emily Doolittle (Dakota Ridge H.S./Littleton, Colo.); Sophia Hadad (Windsor H.S./Windsor, Colo.); Karissa Lukasiewicz (Valor Christian H.S./Highlands Ranch, Colo.); and Jenna Siebert (Valor Christian H.S./Highlands Ranch, Colo.) on its roster. It’sJustWork features Rickea Jackson (Detroit Edison Public Academy/Detroit, Mich.); Diamond Miller (Franklin H.S./Somerset, N.J.); Kateri Poole (Monsignor Scanlan H.S./Bronx, N.Y.); and Cavina Rickards (Christ the King H.S./Queens Village, N.Y.). Quest is comprised of Samantha Brunelle (William Monroe H.S./Ruckersville, Va.); Paige Bueckers (Hopkins H.S./St. Louis Park, Minn.); Haley Jones (Archbishop Mitty H.S./Santa Cruz, Calif.); and Hailey Van Lith (Cashmere H.S./Wenatchee, Wash.). Team Denver’s roster includes Francesca Belibi (Regis Jesuit H.S./ Aurora, Colo.); Cameron Brink (Southridge H.S./Beaverton, Ore.); Jana Van Gytenbeek (Cherry Creek H.S./Greenwood Village, Colo.); and Avery Vansickle (Regis Jesuit H.S./Castle Rock, Colo.). TGB features Olivia Cochran (Carver H.S./Columbus, Ga.); Madison Hayes (East Hamilton H.S./Ooltewah, Tenn.); Treasure Hunt (Hamilton Heights Christian Academy/Chattanooga, Tenn.); and Raven Johnson (Westlake H.S./Atlanta, Ga.). The Future teammates are Raegan Beers (Valor Christian H.S./ Littleton, Colo.); Rori Harmen (Cypress Creek H.S./Houston, Texas); Ashtynne Marottes (Vista Ridge H.S./Austin, Texas); and Sa’Myah Smith (DeSoto H.S./DeSoto, Texas). Western PA Elite is comprised of Lizzy Groetsch (North Allegheny H.S./Pittsburgh, Pa.); Kylee Lewandowski (North Catholic H.S./Butler, Pa.); Tess Myers (North Catholic H.S./Pittsburgh, Pa.); and Jayla Wehner (Norwin H.S./North Huntingdon, Pa.). Blackwell (2018), Djuric (2018), Gombs (2018), McCorkle (2018), Molloy (2017, 2018), Mulvaney (2018) and Prim (2018) have competed in past USA 3x3 U18 National Championships. Blackwell and McCorkle were members of the 2018 U.S. Youth Olympic Games 3x3 Basketball Team that finished in 10th place. 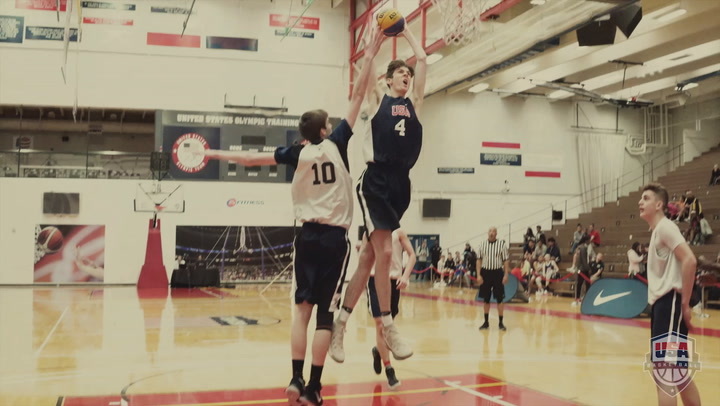 Burnett and Morton are participating in the 2019 USA Junior National Team minicamp at the NCAA Next Generation event at the NCAA Men’s Final Four. 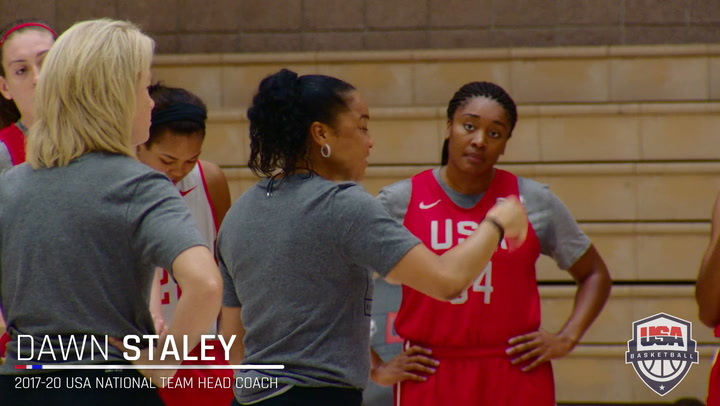 Blackwell (2016, 2017), McCorkle (2016), Morton (2017, 2018) and Timberlake (2018) have participated in a five-on-five USA Basketball team training camp. Beers (2018), Belibi (2017), Brunelle (2018), Bueckers (2018), Fudd (2018), Lewandowski (2017), Merritt (2018), Moore (2018), Siebert (2018), Van Gytenbeek (2017, 2018), Van Lith (2018) and Vansickle (2017, 2018) have competed in past USA 3x3 U18 National Championships. Brunelle, Bueckers and Van Lith won gold as members of the 2018 U.S. Youth Olympic Games 3x3 Basketball Team. Belibi, Brink, Brunelle, Bueckers, Fudd, Jones, Taylor and Van Lith earned gold medals with the 2018 USA U17 World Cup Team. Belibi, Brunelle, Bueckers and Fudd were members of the 2017 USA U16 National Team that claimed gold. Brunelle earned a bronze medal with the 2016 USA U17 World Cup Team. Brunelle, Bueckers, Van Lith and Jones will participate in the 2019 NCAA Next Generation for Women at the 2019 NCAA Women’s Final Four. In addition to those who earned spots on USA Basketball teams, DeBerry (2018 U17), Goforth (2017 U16, 2018 U17), Hayes (2018 U17), Treasure Hunt (2017 U16, 2018 U17), Hunter (2018 U17), Jackson (2017 U16, 2018 U17), Johnson (2018 U17), Kampschroeder (2017 U16, 2018 U17), Martino (2017 U16), Merritt (2017 U16), Miller (2017 U16, 2018 U17), Moore (2018 U17), Poole (2018 U17), Spear (2017 U16, 2018 U17), Van Gytenbeek (2017 U16, 2018 U17), Vantimmeren (2017 U16, 2018 U17) and Verhulst (2018 U17) have participated in a five-on-five USA Basketball team trials.